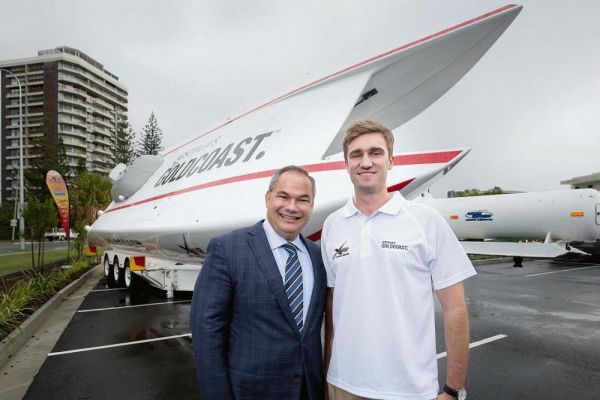 29 June 2015, Gold Coast – City of Gold Coast Mayor Tom Tate played a pivotal role in securing the Gold Coast as the host venue for Round 4 of the UIM XCAT World Series. This most sought- after brand of powerboat racing will be showcased on the Gold Coast from August 21-23. At the launch of the event in Australia today, Mayor Tom Tate said the inaugural XCAT event was a sporting coup for the Gold Coast. “To secure an international event of this status reinforces the city’s position as a leader in hosting major sporting events,” he said. “The XCAT Grand Prix gives us a unique opportunity to show off our beautiful waterways and will give the Gold Coast significant exposure around the world. The race will run on The Broadwater and Doug Jennings Park at The Spit will be home to the innovative and exciting XCAT Central comprising a Food Bazaar, VIP Experience, Entertainment Quarter, Kids Zone and Pit Area. The XCAT Gold Coast event is being supported by a strong media campaign including valued television, radio and press partners as well as two Surfside buses wrapped in XCAT branding making their way around the Gold Coast, thanks to TAG /Transit Australia Group. “XCAT Racing is motorsports on water and we are very excited to be coming to the Gold Coast. The Broadwater is a magnificent backdrop and will provide for awesome racing. With views west to Wave Break Island and north to Stradbroke, spectators will have the added advantage of being close to the action,” said O’Connor. The event will generate global TV exposure for the Gold Coast as a destination and one of the highlights for the event will be local XCAT pilot Tom Barry-Cotter racing the brand new Australia’s Gold Coast XCAT boat. CEO of Gold Coast Tourism, Martin Winter said, "XCAT is a welcome addition to the list of world class sporting events held on the Gold Coast. XCAT caters not only to those spectators interested in witnessing some of the fastest power boats on the planet but it also provides the opportunity to show off Middle Eastern culture and all that has to offer." The first XCAT (Xtreme Catamaran) World Series was run by the World Professional Powerboating Association (WPPA) in the UAE in 2008. Since then the Series has evolved globally, with the aim of reaching six continents. The XCAT World Series Gold Coast event will be a vibrant addition to the Gold Coast’s already exciting sporting calendar and is bound to thrill existing and new fans with a weekend of spectacular fast paced action and entertainment for people of all ages.